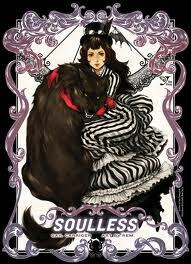 The first book of the Parasol Protectorate has been turned into a manga by the good people at Yen Press, beginning with Soulless Volume 1. This starts and ends just where the first book does. We meet Miss Tarabotti after quite the incident at an evening party. She rather inadvertently kills a rogue vampire that tries to make a snack out of her, bringing her once again to the attention of B.U.R. and their chief investigator Sir Conall Maccon, Alpha of the Woolsey pack. As other young rogues are identified, and some of the usuals in town go missing, it's up to Alexia to figure out what's going on before more people find out about her...disability. Of course the major players are all here. We meet Lord Maccon's Beta Professor Lyall, the ever-flamboyant Lord Akeldama, and even Miss Hisselpenny shows up for a brief scene. Mr. MacDougall and the Hypocras Club factor in prominently, and even Floote and Biffy get a panel or two. The problem with the adaptation is that it's simply too short to do the original any sort of justice. The novel has the page count for Alexia to be more reticent about Lord Maccon's advances, as befits an assumed old maid of the era. The mystery of the Hypocras Club is cut short here as well; I'm not sure it's mentioned after the first scene at the breakfast table here. And most tragic of all, Miss Hisselpenny is only seen once, during a brief walk with Alexia. I understand that Yen Press might want to mimic the original books with volumes that contain a complete story. The problem with this is that the charm of The Parasol Protectorate series is in the details. Miss Hisselpenny's penchant for rather distressing hats. Alexia's fondness for a good tea service. Lord Akeldama's outrageousness, yet fondness for the people closest to him. When the story is so pared down, all of this is lost. Nevertheless, it's wonderful to see the gang together again, and the artwork is beautifully done. While Alexia may not have been showing as much of her assets as this artist tends to draw, the detail on the dress of both the women and the men is top-notch. Kudos to Yen Press for releasing this story to a whole new group of readers who may never have been exposed to it otherwise. Highs: Seeing Lord Akeldama in all his pretty-boy splendor as a manga character is for me the highlight of the volume. Lows: While Alexia loosens up quite a bit in later volumes, it's odd to see her be so sexually forward so early on. Verdict: Perfect for someone who is already a fan of the series, but perhaps not the best introduction.